Rather than compose yet another 1,000+ word monologue with every little detail of this busy weather forecast, let me give you 9 bullet points illustrating what to expect in the coming days. 1.) The coastal flooding threat has calmed, as the on-shore flow has shifted, with less ocean water pushing against the Jersey Shore. However, the back bays are still pretty full after 4 days of elevated high tide cycles, so some tidal flooding is likely. Fingers crossed we will experience fewer water inundation issues during the morning high tide, coming up on the oceanfront around 9 a.m. 2.) Fog, mist, and spotty showers may impact your Tuesday morning. As the fog burns off, we might actually catch a hint of sunshine by midday! High temperatures will bump to about 80 degrees, and it will feel a bit more humid too. 3.) 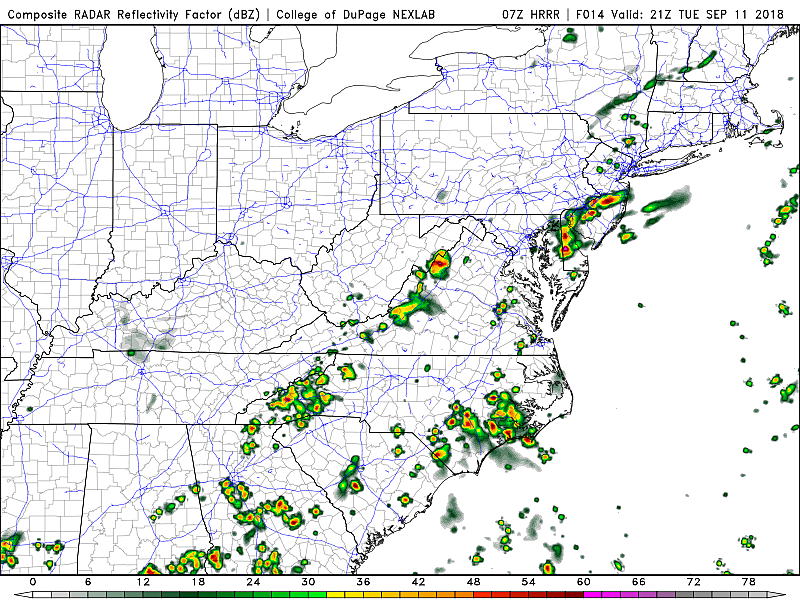 A round of scattered thunderstorms is expected to fire up starting around 2 p.m. Tuesday afternoon, through the evening hours. A few of those storm cells could be on the strong side, with pockets of heavy rain potentially leading to flash flooding. 4.) More showers and clouds for Wednesday, with high temps holding steady around 80 degrees. 5.) Thursday looks mostly dry during the day, with a few isolated showers and mostly cloudy skies. Might turn out to be a halfway decent day, with highs again near 80. 6.) 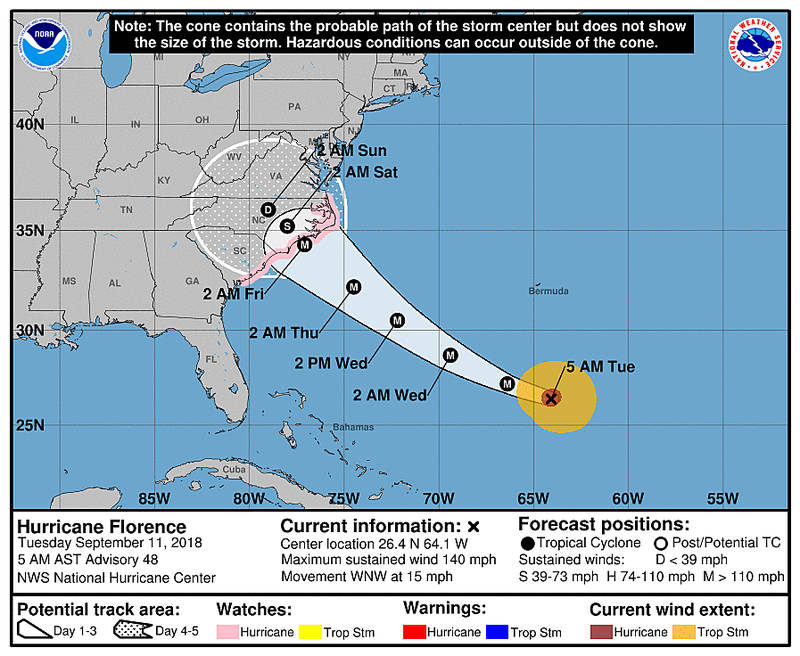 Major Hurricane Florence is a category 4 hurricane with maximum sustained winds of 140 mph, as of the 5 a.m. update. It is totally possible that the storm reaches category 5 strength (156+ mph) as it approaches the U.S. East Coast. The center of the storm is still locked-in on a North Carolina strike, making landfall sometime late Thursday or early Friday. 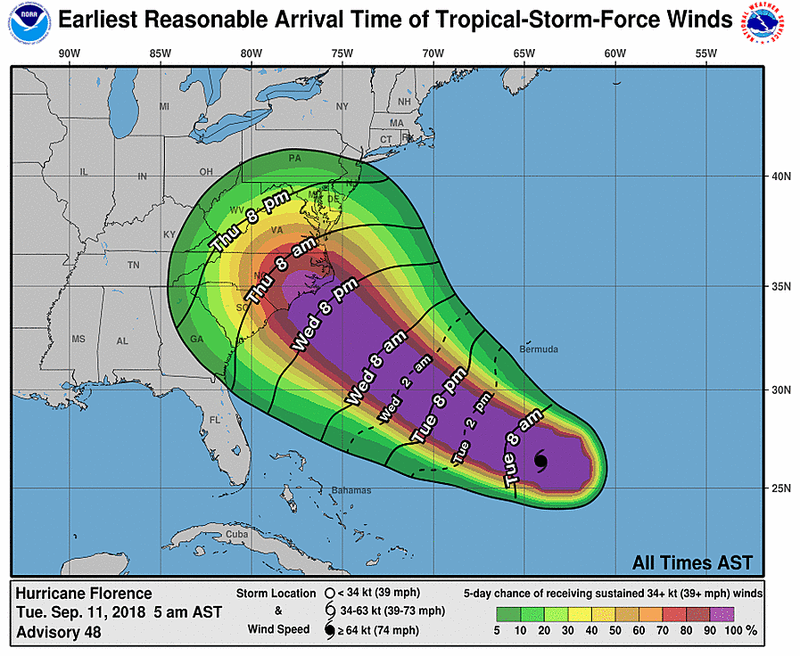 Hurricane watches and storm surge watches have been posted for Virginia, North Carolina, and South Carolina. 8.) The surf is already rough along the Jersey Shore, with 3 to 6 foot waves expected and a high risk for rip currents posted Tuesday. New Jersey's storm surge will be minimal compared to the 6-9+ feet of surge expected along much of the North Carolina coast. But even a foot or two of extra seawater here could lead to inundation of vulnerable, low-lying areas. We'll have better resolution on potential surge and water levels over the next day or so. 9.) Where Florence goes next is still a big question mark. Models seem to favor a solution that stalls Florence directly over the NC coast for about 24 hours — a very, very bad situation there. After that, the consensus track takes the storm several hundred miles inland, swinging back toward New Jersey early next week. This is still a low confidence forecast, mind you, but tropical rainfall (3+ inches) next Monday-Tuesday could pose a significant flooding risk. Next weather blog is scheduled for Wednesday morning by 7 a.m.